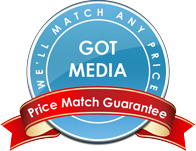 GotMedia.com sells a complete line of DVD+R DL Media in Orange County, CA. Introduced in late 2003, dual Layer DVD-R media offers double the capacity of a single layer DVD-R. Dual layer DVD R media is available in 2 formats, DVD-R DL and DVD+R DL. Brand is probably the most important thing to consider when you are shopping for blank Dual Layer DVD R media. A quality brand will almost always be the best choice for any application whether it be for authoring, archiving, master recording, duplicating or just burning a DVD to watch on your TV or computer. Quality brands are made to perform better, last longer and have the most universal compatibility across various DVD players. Verbatim has been known to produce the highest quality Dual Layer DVD R media. MAM-A is also a good manufacturer of DVD R DL. Listed below are some of the best options for Dual Layered DVD R media at competitive prices. If you would like assistance in choosing the right DVD+R DL or DVD-R DL product, don't hesitate to call one of our knowledgeable representatives at 1-866-409-1090.